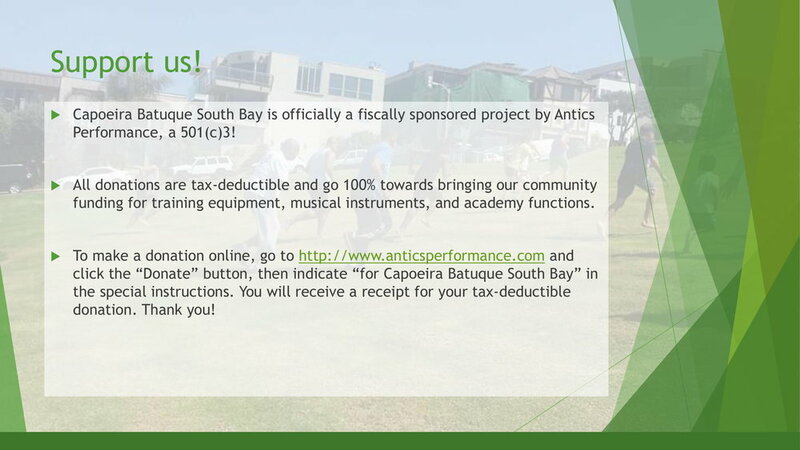 This Fall season, right before the tax year is over, we are contacting you in the effort to get your support for our Martial Arts Academy- Capoeira Batuque South Bay. Below is information about our work in our community, our mission, and a little bit about the beautiful art of Capoeira. Recently there has been a growing awareness about the importance of men, women, and young children being exposed to different models of women and female experiences in our society. Families understand how crucial it is for their kids to see women in a variety of positions, showcasing and modeling a spectrum of their strengthens. We can see now how important it is for us to balance the hyper-sexual and objectifying visuals the youth is flooded with on social media and commercials with other ways women and young girl can get positive attention and stand out in the world. The female body is powerful and beautiful but its not the only strength a woman has. Capoeira Batuque South Bay led by Prof. Dana "Minha Velha" Maman, has it as one of its missions to show diversity- among other diversity of female strengths. We are proud to have strong women martial artists teaching and taking part in capoeira, gymnastics, music, and drumming- instructing children, and young adults to create an environment of creativity and respect for women utilizing Afro-Brazilian culture. Please, this holiday season be part of our mission and donate to a worthy cause. All proceeds will help us expand our kids program and attain new and much needed equipment. Read a head on how to get involved all while getting a tax write-off for your efforts. Obrigada!